I just love the feeling of a fresh start that January brings — I also feel this way around the beginning of September as well even though I haven’t been “back to school” since 2008. I always feel like it’s just a great time to re-evaluate your priorities, routines, and schedule. Each year, I order a new planner and enjoy setting it up with all of our activities and commitments for the year. 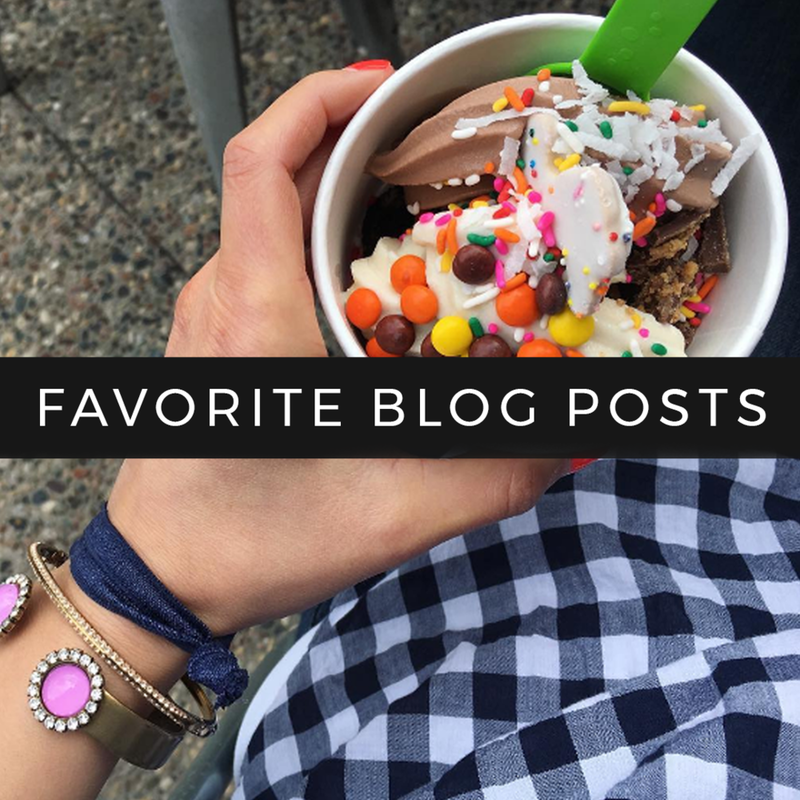 I originally wrote the first 2/3 of this post back in early January and planned to have it published around that time but with baby arriving, blogging has been squeezed into little pockets of free time while Fletcher is napping. :) So, here we go with our yearly intentions on February 8th! This year, the planner that I always choose had some extra “prep” pages added to the beginning and it was exactly what I needed to work through before starting 2019. I sat down last month and really poured my heart into evaluating 2018 — processing what worked and what didn’t work. I wanted to share some of these prep pages on my blog — even if you don’t have one of these planners, it’s something that could easily be done in a journal as you prepare for the next twelve months. What didn’t work last year? Really sitting down to think about these four areas of my life was extremely helpful. Not only did it force me to look back and evaluate 2018, it helped me to notice patterns and systems that helped or hindered my day to day life. I also chatted with a good friend of mine about a lot of my reflections since she was feeling the same way about the past year of her own life. This was so helpful because not only was there someone that could say “me too” to a lot of how I felt, but we were able to springboard ideas off of each other in hopes of making 2019 a great year. After completing the prep pages, the main thing that stood out to me was that there was a lot of feeling "overwhelmed.” I’m one of those people that can go, go, go, until I can’t — and then the brakes come to a screeching halt and the cycle starts all over again. Some of the things that were life-giving for me included regular dates with Andy, dinners / coffee with my auntie, spending time with friends, and prepping for my work day the night before (lunch packed, bags by door, clothes laid out, etc.). Working out, eating healthy, and doing something creative on the regular also falls into this category! So, I think that needs to happen in 2019 is that I need to do more of the life-giving activities and really focus on not letting things get out of control (too many “yes-es”, going to bed with dishes in the sink, etc.). I feel like this sounds ridiculous, but my day just starts SO much smoother when I go downstairs to make my coffee and step into a spotless kitchen instead of one that has a full dishwasher and sticky counters. I feel like I’m always saying I’m going to do this but for some reason, self-care (along with my mental / physical health) always gets put on the back burner whenever life is crazy (which, newsflash — it kind of always is). I’d really like to invest in these two areas of my life even if it means making sacrifices in other areas in order to make it happen. My gym membership reactivates in a few weeks after being frozen during pregnancy and I’m really looking forward to not only getting back into a gym routine but also utilizing things like the steam room in the women’s locker room. I used to spend 10 minutes in there after almost every workout a few years ago and it was seriously like a little tropical vacation leaving me feeling calm and refreshed. 2018 was filled with so many things and I often felt like I was flying by the seat of my pants. House hunting, moving, pregnancy, starting a new job, etc. was a lot in such a short time span and I often found myself eating meals on the go, multi-tasking, and overall just not having enough rest or friend time. I want to focus on slowing down, scheduling more time with those around me, not eating in my car in-between commitments, etc. I feel like having a baby has really made me rethink some of my priorities because now there is someone looking up to me and the actions that I take each day — I want him to know me as a mom that is calm and present, not frazzled and overwhelmed. Time flies by so much faster as you get older and I’d really like to prioritize being intentional with my days and in my relationships. Speaking of which, I also want to be more intentional with reaching out to people. So often, I think about texting a friend to see if they want to grab coffee or an impromptu HH but then rethink it and tell myself they’re probably busy and it’s snowing again so do I really even want to go out that night? Time to stop overthinking and just send the texts to spend more time with those that I love! This is one area of my life that has really been on my heart lately after coming across this article. The day after I read it, someone had posted something similar on Facebook about how smartphones are becoming our priority before our children and you guys, it just broke my heart. I want to make sure that I’m being mindful of using my phone when I’m around my people, so I deleted Instagram and Pinterest off of my phone to avoid mindless scrolling out of habit whenever I have a free minute or feel bored. I'll keep the apps on my iPad but really only use my iPad when I’m on the treadmill or having some down time during Fletcher’s naps — this will help keep my time spent on social media more in check. What are some of your intentions for 2019? Do you monitor your screen time? Today I’m capturing a day in the life and it will be my last one before becoming a mom since my due date is this upcoming Wednesday! This is by far my most-requested type of blog post so I’m hoping to start doing these more regularly — maybe every other month or so especially since my life is going to be so different in these next few months as we bring home baby and then when I go back to work later in the spring. 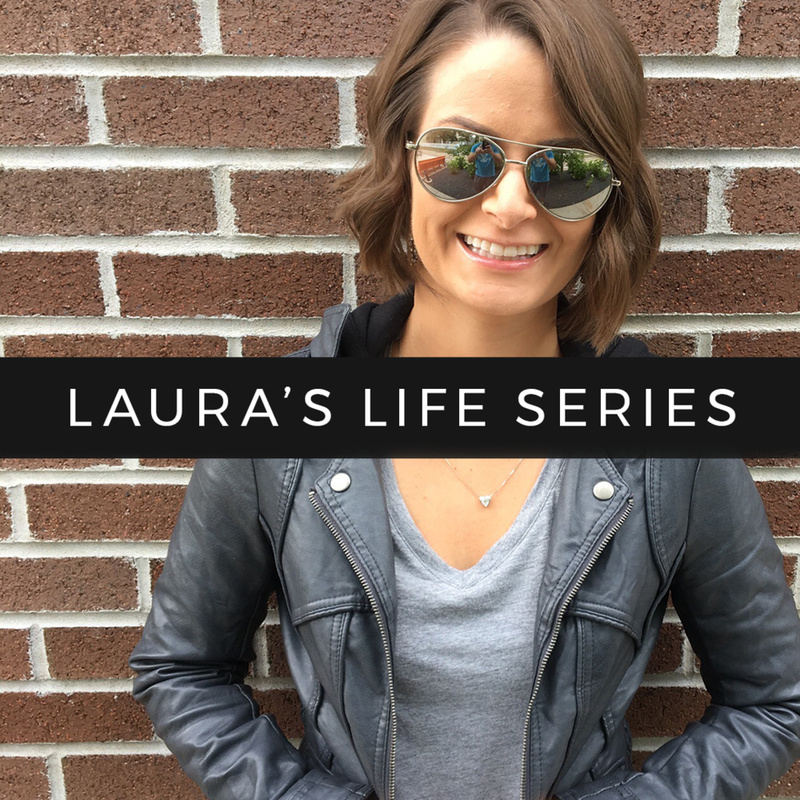 Below is a play-by-play of my day yesterday — I’ve been enjoying a little down time, baby prep, and running some last minute errands until our little guy arrives. It wasn’t the most exciting of days, but I felt like I accomplished a lot so that’s a success in my book. 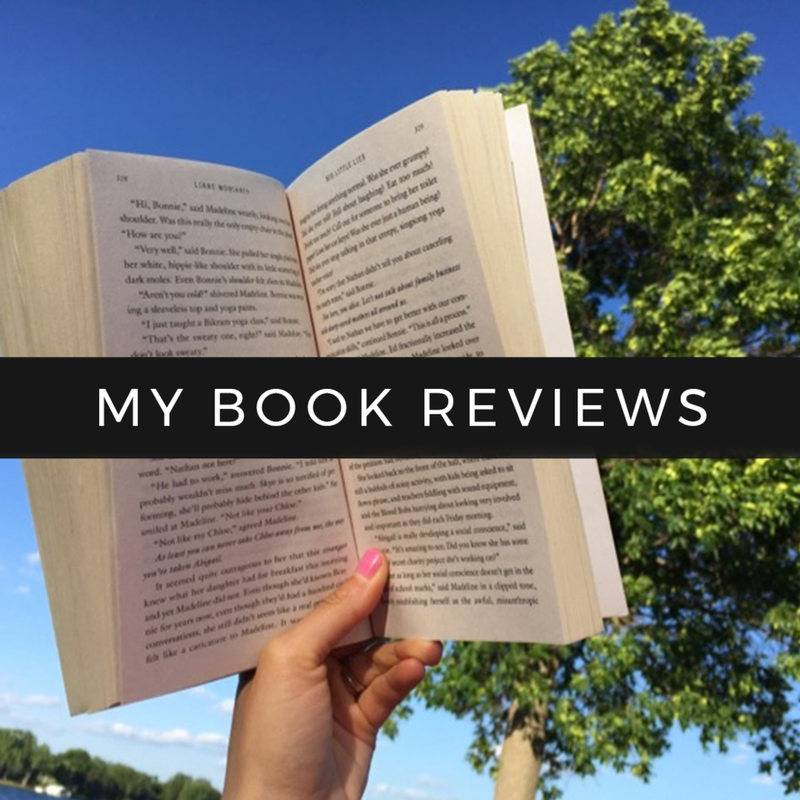 The last time I did one of these posts was last fall — click here to check it out! I’ve been sleeping a little better lately mainly due to sleeping at an incline. Around 37 weeks, I started having trouble breathing whenever I laid down — my doctor said it’s most likely because baby is getting bigger and squishing my diaphragm / lungs. Ever since sleeping with a few pillows propped up behind me, I’ve been snoozing through my usual 2:30am middle of the night insomnia + snack time which has been SO nice! I’m still waking up a lot earlier than I’d like (4:30am), but it’s nice to at least not be WIDE AWAKE for a span of 2-3 hours each night. I always wake up starving, so I usually make breakfast before taking a shower. I’ve been really into green smoothies lately and this one is on heavy rotation over here. In the blender I add organic unsweetened vanilla almond milk, organic spinach, organic dates (they’re supposed to help with labor so I’ve been popping three per day), peanut butter, half of a frozen banana, plain 2% Greek yogurt, and some ice. I always pair my smoothie with a hot cup of coffee with this creamer since the frozen drink makes me so cold! I sipped both of these while reading my new devotional and then hopped in the shower. My outfit choices these days are a little limited due to this full-term baby bump, so it’s pretty easy to choose an outfit when you literally have three options that still feel comfortable. Thank goodness for these comfy tees and my favorite maternity jeans! That being said, I’m really looking forward to shopping my closet again in the next few months. I snapped this pic in the “kid bathroom” upstairs and every time I go in there, it makes me so happy to see his little hooded bath towels hanging on the towel rack behind me! My sister gave us those and an adorable little bathrobe as part of his Christmas gift and I’m so excited to use them — babies after bath time is the absolute best! Lately I feel like it takes me FOREVER to get ready and I’m not sure if it’s pregnancy-related or if I’m just dinking around too much but either way, it always feels like a major accomplishment once I leave the bathroom and head downstairs. Speaking of stairs, I’ve reached the point where I can only put my socks and shoes on if I’m sitting on our staircase — it feels so strange to have reached this point because I feel like up until 37 weeks, I didn’t really feel like I had many limitations and then they all came at once! I worked on my blog all morning and answered a few emails from work — I’m trying to pre-write a bunch of posts so that I can still have content going up even when it’s baby time. This whole “not knowing when baby is coming” is both exciting and a little unsettling because it makes it hard to plan out your week! ;) While I was working away, my OB’s nurse called to see if I could pop in later that day for a quick check-in instead of going in on Friday morning. I added it to my calendar and then wrapped up my post before making a quick lunch so that I could head out to run errands before swinging by the clinic for my appointment. I forgot to take a picture, but I promise you didn’t miss anything special — I had an egg scrambled with egg whites and colby jack cheese with an orange on the side. Not the fanciest, but it was a good mix of protein, fat, and carbs which is how I prefer to structure my meals. On this particular day I needed to swing by our local co-op to pick up a few things — I grabbed a canister of this for making lactation energy bites once baby arrives, some flax seeds, and this that I love to use on my salads and in stir fry sauces. I arrived at the clinic about 20 minutes early and used that time to make a quick call to our insurance to double check a few things such as hospital stay and whatnot. Normally I dread these types of tasks, but the customer service guy was super friendly and was telling me about his kids and grandkids so it was kind of entertaining. I also ate one of these before jumping out of my car and heading into my appointment. After the appointment, I made a quick stop at Target to see if a nursing tank I wanted to try was in stock. They didn’t have it, so I’m thinking I might just order a few from Amazon at this point because I'm not having luck finding anything that I like in stores. 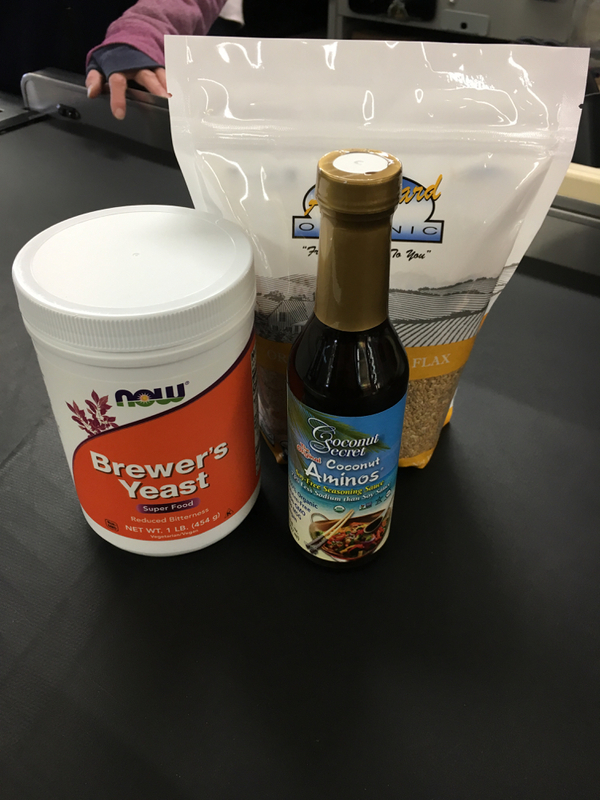 I picked up a few items that we needed and then headed home for the evening. I was starving by the time I got home, so I quickly unloaded my bags and threw together a quick salad. I also ate an apple after this because my hunger has been out of control lately. 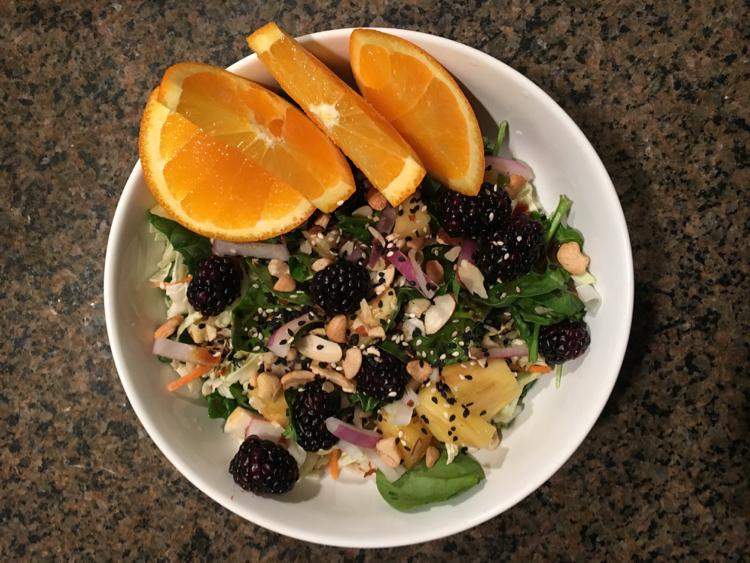 I worked on this blog post while enjoying my dinner and then changed clothes and headed downstairs for a workout. I’ve been committed to keeping up with my workouts even as we get closer and closer to the due date! 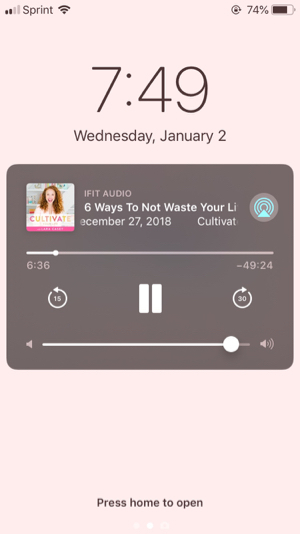 I feel like the time on the treadmill usually flies by really quickly because I use this time to listen to a podcast, read, or listen to music. I typically walk or run each day since I know I’ll have to take a little break once he is born so that my body can heal. Lately I’ve been taking an evening bath in our soaker tub because it feels SO good at this point in my pregnancy. I always add a few scoops of these along with some natural bubble bath that we pick up from Trader Joe’s. I also ate a grapefruit around this time because I seriously can not get enough of these ruby reds right now! Before bed, I usually read for a little bit, do a session from my Calm app, and then am off to dreamland. I try to be in bed by 10pm most nights and typically fall asleep right away! PS I’m linking up with Kristen today. Are your days pretty routine or do they tend to look different each week? Do you eat breakfast right away in the morning? You guys know that I love living a healthy and active lifestyle -- it always makes me feel my best! I recently shared some of my favorite healthy + simple snacks and today I'll be sharing some healthy + simple meals! I'm also linking up with Sarah and Emily to chat about crock pot meals! I prefer to eat a very fresh, simple diet -- most of my meals are composed of mixing a bunch of items I've already prepped (chopped veggies, cooked lean meats, etc.) rather than following complicated recipes. If there's something that I'd like to make -- take tomato soup for example since I just made that a few days ago, I usually just make it up as I go. I know that I like my tomato soups to have a little texture and have a lot a basil, so I roasted a huge pan of tomatoes, garlic, and onions, pureed it with veggie broth and tons of basil, and then seasoned it to taste (adding EVOO, oregano, and S&P) as it was simmering on the stove. 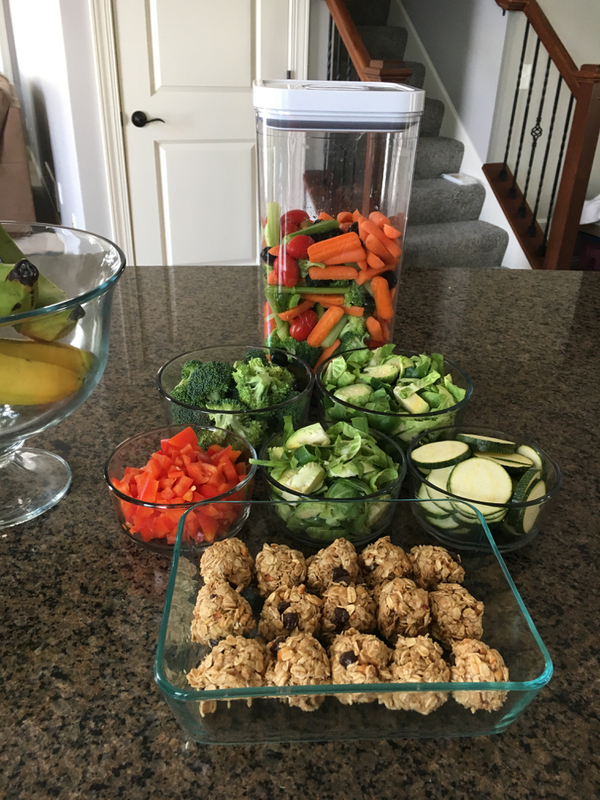 For me, the key to making healthy + simple meals is meal prepping! I do this almost every Sunday afternoon to set myself up for success during the week. Veggies are washed and chopped, grapes are rinsed and put into a large container, sweet potatoes are sliced, and chicken / turkey / salmon (whichever is my protein of choice for the week) is cooked. 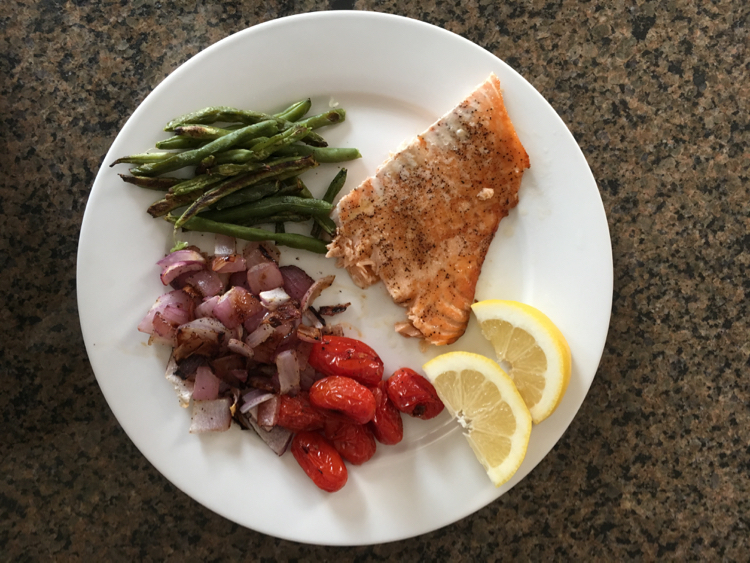 Below are some of the meals I've been enjoying lately -- they all were thrown together using items from my meal prepping and most don't take more than a few minutes to make. Deconstructed Greek Salad - leftover salmon from our Sunday dinner, romaine, tomatoes, cucumbers, olives, homemade hummus, homemade tzatziki. Roasted Veggie Bowl - refried organic black beans, homemade hummus, roasted veggies: zucchini, roma tomato, brussels sprouts, red onion. I paired this with a whole grain flax tortilla with hummus to give this meal a little more staying power. 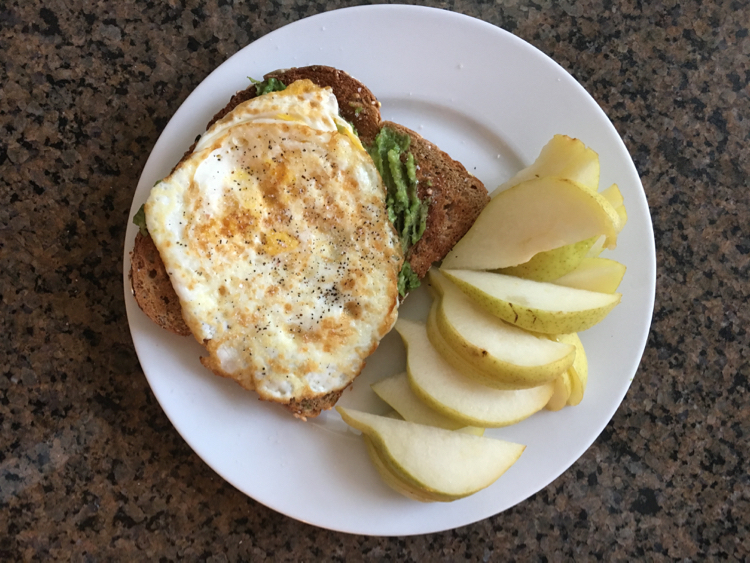 Avocado Toast - Toasted Ezekiel or Dave's Killer Bread, mashed avocado, a tomato slice, and a fried egg paired with fruit on the side. Thai Chicken Flatbread - Whole grain flat bread, topped with cheese, Thai-seasoned chicken, red cabbage, red peppers, carrots, green onions, cilantro, sesame seeds, and drizzled with a homemade Thai peanut sauce. We love these flatbreads (they're at Costco) -- they're great for making wraps, quesadillas, burritos, and flatbreads. Baked Salmon + Veggies - Baked salmon (I top it with butter or olive oil and S&P before baking) and roasted veggies -- usually something green, some onions, and grape tomatoes. This is a meal that we usually make on Saturday or Sunday evenings when we're at home. 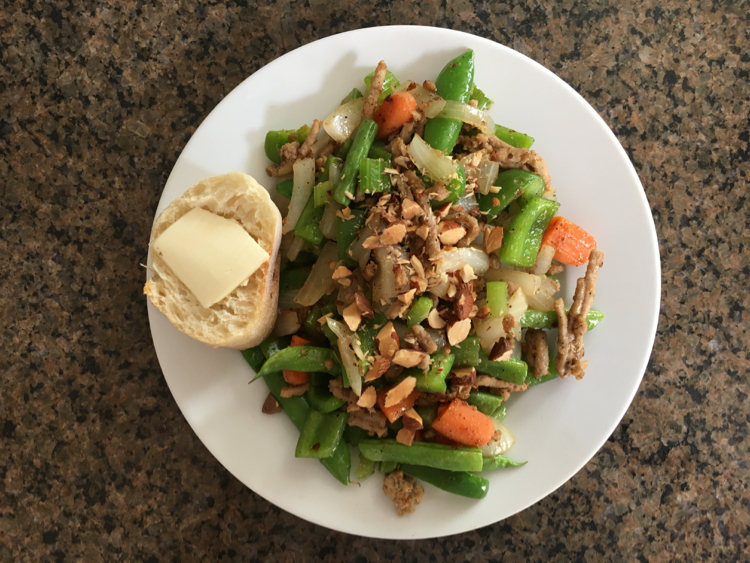 Stir Fry - Veggies and chicken or turkey mixed with General Tso's stir fry sauce and topped with chopped almonds or peanuts for some crunch. I usually pair this with some bread or rice so it holds me over longer. I love making these when I need to clean out the fridge -- any veggie is great to add to the mix! Salad + Chips and Salsa - I like to always have veggies, some sort of fat (cheese or avocado or nuts), and a protein on my salads. Most of the time I make my own dressings -- either a honey mustard one or a vinaigrette made with EVOO, lemon juice, vinegar, S&P. This meal is perfect for hot summer evenings. Buffalo Chicken Flatbread - Buffalo chicken, cheese, onion, tomatoes, romaine, and a drizzle of ranch. 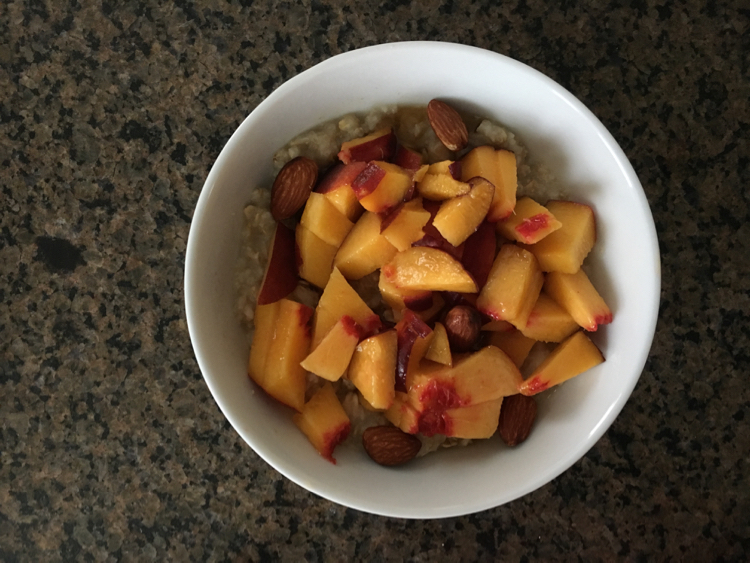 Oatmeal + Fruit - Old fashioned oats with a drizzle of pure maple syrup, chopped peaches, and a sprinkling of almonds for some crunch. Homemade Pizza - Multigrain flatbread topped with pizza sauce, mozzarella, sausage, and tons of veggies. Clearly we use these flatbreads all the time! Packed Lunches - As far as lunches go, I almost always bring a wrap, soup, salad, or leftovers to work each day. Snacks for work always include a yogurt cup, a fruit, a veggie or two, and some almonds. Two of my blogging buddies are chatting about crock pot meals today and here's the thing -- I never use our crock pot! Ever! Andy uses it all the time to make a huge batch of chicken breasts every week, but I never use it. I don't eat a lot of meat and I haven't really experimented with crock pot recipes for other meals. I'm really looking forward to seeing some of the other linked posts from today to get some ideas to try out this fall and for easy meals once baby is here! What are some of your go-to meals? What do you usually pack in your lunch? I've been back to the short bob for almost 6 months now and am still obsessed with this sassy 'do! Since my hair is so thick and fine-textured, it takes a little help to get it to style how I'd like it to. The items below are what make the magic happen! As far as styling tools go, I use this hairdryer and I've been a huge fan of this flatiron -- I purchased it back in 2013 and it's still going strong! I don't really use curling irons / wands anymore now that my hair is short -- if I have waves or curls, it's done using my flatiron. My stylist recommended this product to me -- especially since I use heat on my hair every morning (hairdryer and flatiron). After combing through my freshly washed hair, I rub a dime-sized amount of this product throughout my hair. Next, I spray this sea salt spray all over my hair to give it a little texture. This is my favorite mousse of all time -- I just work a generous dollop of it into the roots of my hair before drying it. After drying my hair, I'll flat iron it to get it styled how I want -- then I add this texturizing dry shampoo to my roots to give it a little more volume / texture. In the winter, my hair gets staticky, so just a dot of this pomade on my palms does wonders for taming the fly-aways. This product is also a dream in the summer if you live in a humid climate. This hairspray is perfect for spraying everything down because it holds things in place but still allows movement so your hair doesn't look stiff. I use this stronger hold hairspray for teasing sections of my hair or if I need to hold a partial updo in place. What are your favorite hair products? Up until graduating college, I was a night owl -- staying up late and sleeping in until mid-morning. Those days are long gone, and I attribute the drastic change to the fact that I had to alter my sleeping habits once starting my first design job. Morning is definitely my favorite time of day -- I love the feeling of a fresh start and the possibilities that a new day brings. I feel as though I'm most productive / motivated during this time of day and like to power through tasks to get my day off to a successful start. Most mornings, I'm up at 5:45am and enjoy taking my time to get ready rather than rushing out the door feeling frazzled. If you wake up tired, it's going to be hard to get out of a nice warm bed and start your day. I typically go to bed around 10-10:30pm to ensure that I get enough rest each night. I charge my phone on the dresser on the opposite side of our bedroom, which makes it a lot harder to hit snooze! Also, once my alarm goes off, I get up -- no trying to fall back asleep for "5 more minutes" or laying in bed scrolling through my phone. I also have an evening routine (pack lunch, do something to unwind, lay out my clothes for the next day, etc.) and I really feel like this is the secret to success. Laying out my clothes the night before and packing my bag for work (lunch, gloves / hat, anything that I need to run an errand after work, etc.) is packed and ready to go so there's no scrambling around looking for my white cami tank to wear under my sweater eight minutes before I need to head out the door. This one is definitely key for me -- I love waking up early, showering + getting ready, and then cozying up my cup of coffee while reading for a bit. Sometimes it's a few chapters of a book, a devotional, or just reading through blogs on my Feedly app. One of my friends at my first job told me that she would wake up 20 minutes before she had to leave for work in the morning, throw on some clothes, and skip breakfast because she hated mornings so much. 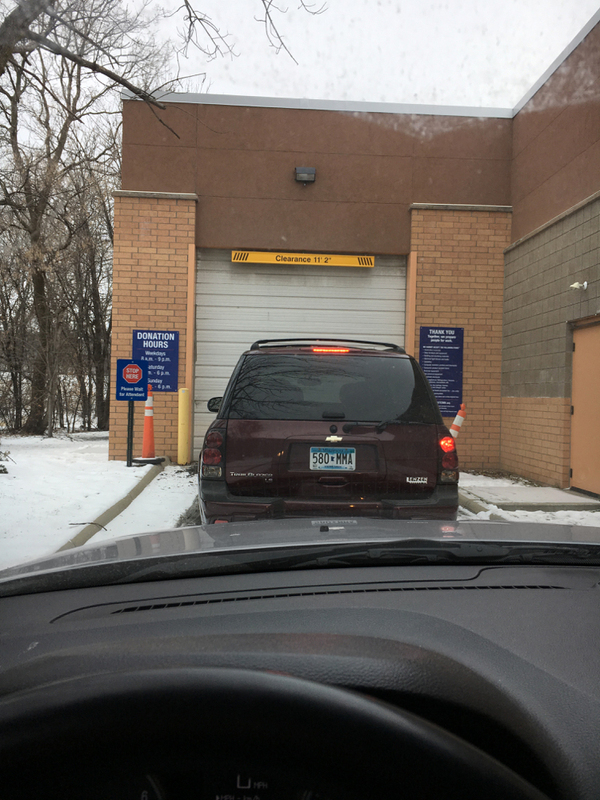 I don't know about you, but that's definitely not how I want to begin my day. I like to give myself some buffer time while getting ready, that way if I spill coffee on my shirt or if my hair just isn't cooperating, I have enough time to take care of the issue without being late to work. What are some things you do every morning?